~ Search results - 10 products found! The product allows you to save/delete messages and attached files based upon specified criteria directly while message passing (sending/receiving) through Exchange Server. Print Agent for Exchange is a solution for Microsoft Exchange Server 2003/2007/2010, which allows you to automatically print out the necessary emails and attachments. The product consists of three components – a management console, transport agents, installed on the Exchange server, and one or more services that are directly processed printing. A practical system of rules, including conditions, actions and exceptions, allows you to define criteria for printing of necessary messages and attachments. Print Agent for Exchange can print both email messages and attached files (images, html, PDF, txt). MAPILab Rules for Exchange is a program for creating and managing Microsoft Exchange Server and Small Business Server 2000/2003 server rules for processing incoming messages. The product supports any type of message and uses a completely different technology in its work. Special Offer for MSExchange.org visitors: 10% discount is available until 1st of April, 2005! Use the coupon code MXN934T when booking. HarePoint HelpDesk for SharePoint allows you to build a helpdesk system in SharePoint 2010 environment. The helpdesk is designed especially for SharePoint and it is ready-to-use right out-of-the-box. 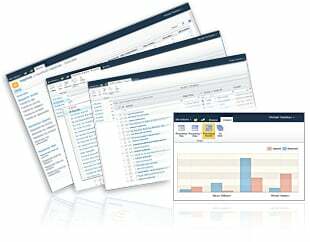 The product key features: request processing logic is based on SharePoint declarative workflows; wide collaboration possibilities for helpdesk staff; fully customizable ticket forms; reports and dashboard for staff performance monitoring. 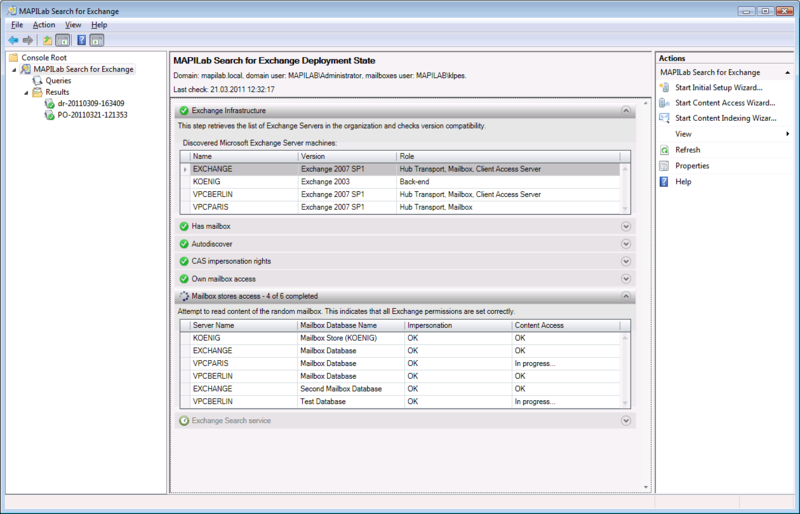 MAPILab Search for Exchange is a solution for searching messages and other items in multiple mailboxes on Microsoft Exchange servers. The product is a tool for carrying out multi-mailbox searches, and provides greater functionality than the built-in features in Microsoft Exchange 2007/2010 servers. MAPILab Search for Exchange is designed to fulfill a range of tasks (such as internal investigations, team members activity monitoring, legal discovery) to automate the e-discovery process in your organization. The key features of MAPILab Search for Exchange: Searching in any mailboxes over all servers of the organization; Flexible search parameters including searches considering search query language, searching by message types, mail folders, dates, mail senders/recipients, etc; Capability of quick search for additional information based on initially retrieved data; Efficient search result processing in the specially developed interface. Report categories include: Users. 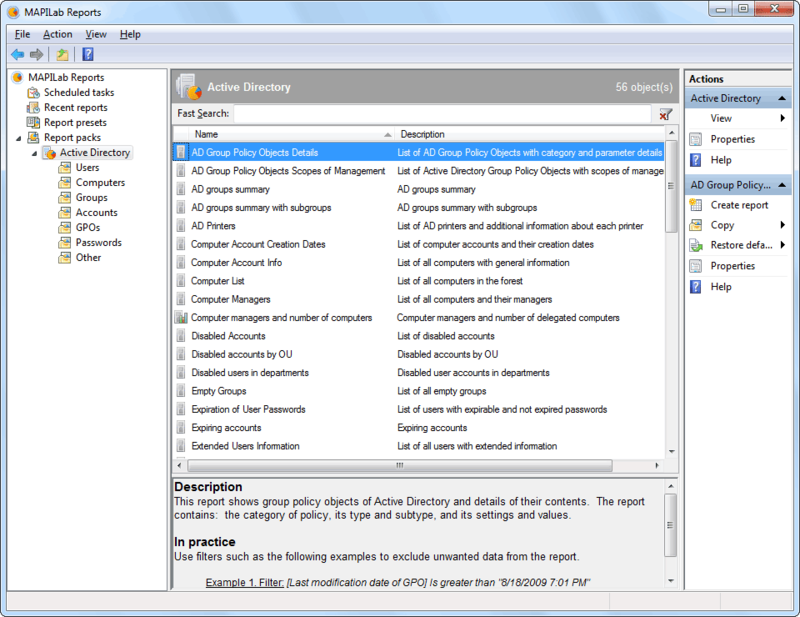 - Computers - Groups- Accounts - Group Policy Objects (GPO) – Passwords – Other (Printers, organizational units and their objects, domain controllers). Key features: - Agentless data collection - 30-days trial period - MMC console - Automatic generation of reports - Adjustable report design.